Uttaranchal is bestowed with numerous rivers, huge forest resources ranging from tropical to temperate, tourists’ places, pilgrimages and feasible climatic conditions for growing fruits, vegetables, food grains, livestock rearing, tea garden practices, etc. The economic development, on the other hand, could not take place partly due to lack of modern technology with innovation in agricultural system and also unwillingness of the people towards using it. Furthermore, due to its harsh climatic conditions, rigorous terrain and distinct identity, as a part of Uttar Pradesh state, the development could not take place and today the state is believed to be one of the poorer states. Infrastructurally, this region is lagged behind due to its inaccessibility. The ideal geographical and agrarian conditions might be used evenly for the developmental processes. Ecologically, the whole region is fragile. The diverse socio-economic activities, harsh traditional beliefs and hard working potentials further change the entire scenario of the state. Only the need of the hours is to frame and implementation of the rational policies and planning for sustainable development of the state. What had appeared during the past, pertaining to the economic development, needs radical changes in policies, planning and beliefs. 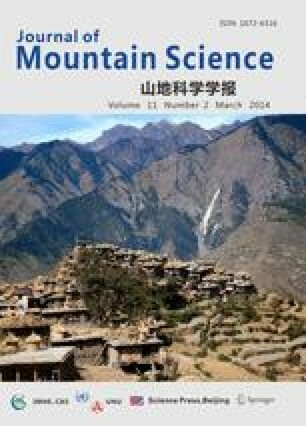 This paper aims to evaluate the present conditions of resources as a form of natural vegetation, agricultural crops, horitcultural farming, herbs, tea garden practices, livestock rearing, hydropower projects and economic development of the Uttaranchal Himalaya.